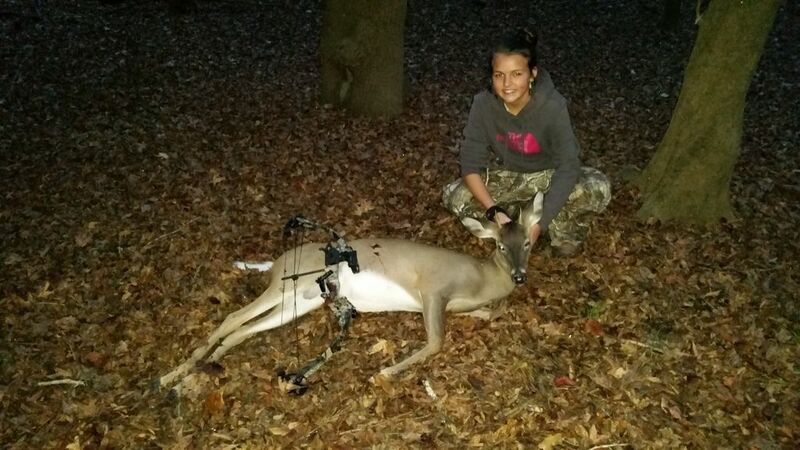 MSDEER.net • View topic - Grand daughter got her first! Grand daughter got her first! My grand daughter and I had a very eventful afternoon. She and her brother came to spend the weekend with me and as usual, we did a lot of outdoor stuff and very little indoor stuff. We started the weekend setting a dozen coyote traps then shot bows for a while. 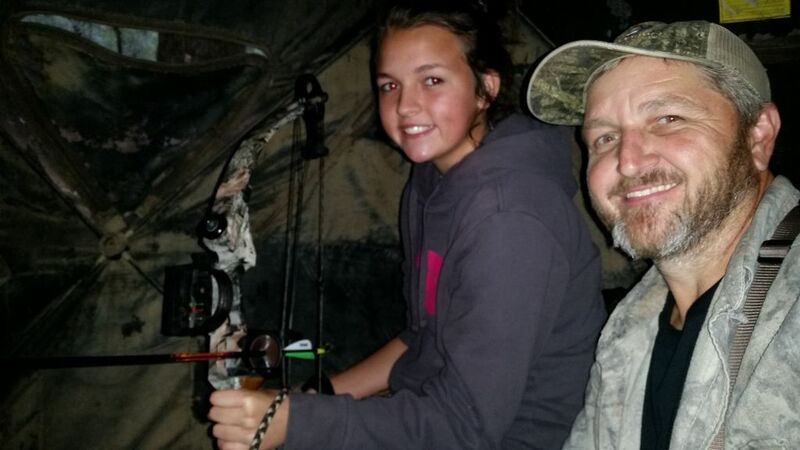 Her brother had first chance to hunt and he chose to take the rifle and sit in a "bucks only" stand. He chose the only plot that has grass in it and it's got a 2 man ladder stand so we hit it. We saw 6 does but the buck that's been showing up late evening pulled a no show. Fast forward to this afternoon, she wanted to go to the ground blind I've had set up on the edge of a slough for about 3 years. It's normally a good spot but there's also normally water in the slough. It's dry as a bone now but the deer still walk the edge of it and when the Swamp Chestnuts are falling, they fall on the side of the ridge and most of them end up in the bottom. We'd no sooner got settled in the blind and got the Thermacell cranked up when she spotted some turkeys coming down the ridge. They were all jakes and came close enough I think I could've reached out and grabbed one. We managed to spook the turkeys and as soon as they ran off I spotted a doe about 75 yards out doing the rubberneck. She finally calmed down and fed on down the ridge and disappeared. Not too long later I heard foot steps right behind the blind. It started popping Chestnut hulls straight to the left of us and the only direction we didn't have a window open. She said she could hear it smacking his food but couldn't see him. Finally it moved to where she could see it out the front window and she told me it was a small buck. I asked how small and she said he was a spike and was standing perfect. I gave her the go ahead and she came to full draw. I was about to die from not being able to see the deer or see if it was angled right but we'd practiced it over and over so I trusted her. As soon as she released I heard the arrow hit and I jumped up to the window and saw the deer go off the ridge and into the dry slough. I could tell the arrow was further back than what I would've liked but it was in him and was up to the fletching. We high fived, replayed the scenario a few times, and after about 30 minutes got out of the blind to look for blood. I was sure we'd have to come back in a couple hours to look for it but told her we'd walk to the edge of the ridge and look for blood anyway. We found the first speck of blood about 20 yards from where the deer was standing and it got heavier as we followed it. I was hesitant to go past the ridge but once we got to the edge I saw the deer laying about 50 yards out in the bottom. I let her keep trailing the blood and she was nearly on top of the deer before she spotted him. The arrow luckily caught the liver and he didn't go far. She's killed a couple deer but this was her first bowkill and she's fired up! The Mathews Mustang with 35 lb draw weight and 100 gr Magnus Stinger did a number on him. Re: Grand daughter got her first! That's awesome! Pulling only 35 lbs what's her affective range? Congratulations to her! What a great hunt, and all the memories made! RoadRanger wrote: That's awesome! Pulling only 35 lbs what's her affective range? I had her shooting targets out to 25 yards but 17 yards is about as far as I'd feel comfortable letting her shoot at a deer. This one was 10 yards so he was well within range. Congrats Dl to you and her! 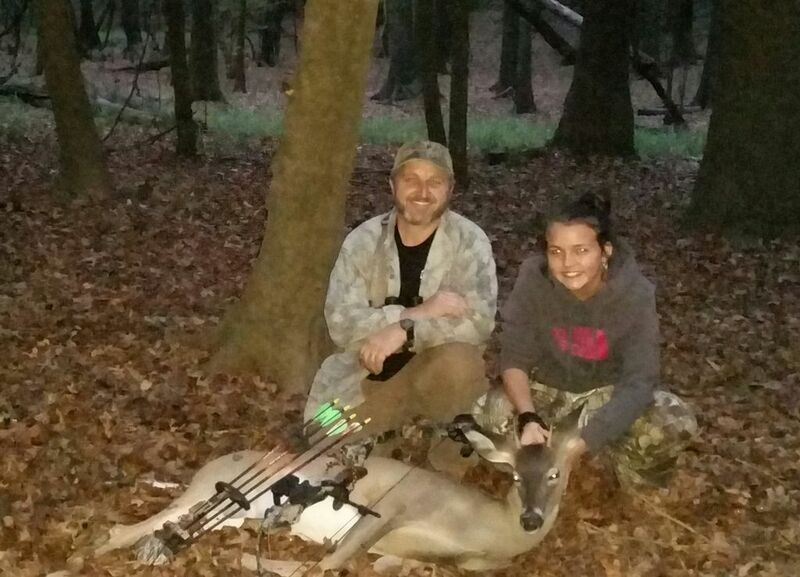 Congrats to both of you...getting him with a bow is awesome! I pray for strength! I'm too young for this. Lol! That's great...my congrats to the both of you. Does she shoot sitting down?